I, AM, officially obsessed with “cauliflower rice”. To be honest, i had my doubts when i thought about making pulao with it. But the end product was so mind-blowing that i can’t wait to try other variety rice items using cauliflower rice. Best part about this rice is it took me all of 15 minutes to make one serving for myself. If you think i’m exaggerating, just try it for yourself. First things first: Crack the head of cloves to prevent them from exploding in ghee. :- this is a very important step. Whenever you throw cloves in hot fat, crack the head. Heat ghee on medium high in a small skillet and throw in the spices and fry for a few seconds. Now throw in all of the veggies and fry for a minute. Add coconut milk. Pour 2 tbsp of water over the spoon to rinse out coconut milk stuck to the spoon on to the skillet. Stir real quick, turn heat to low and cook covered until all moisture is absorbed. About 4 minutes. 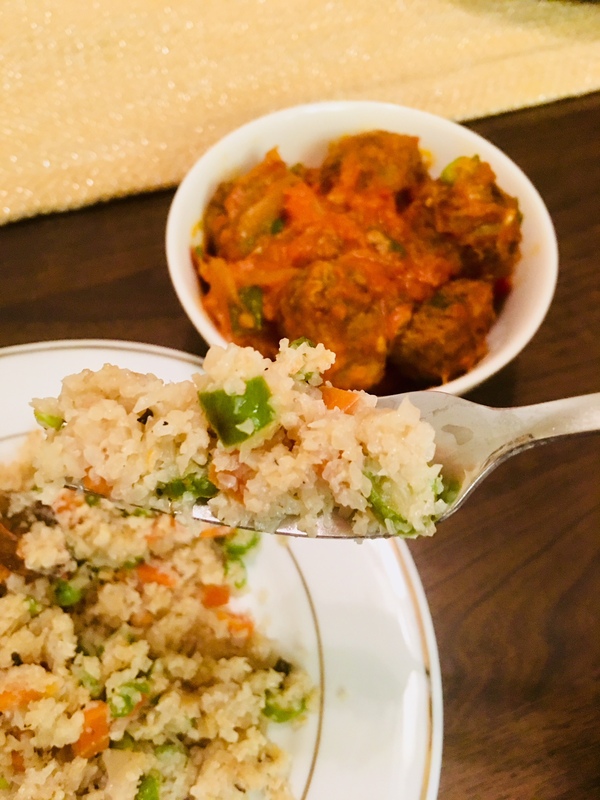 Uncover and fry on medium high for a minute or two and your pulao is ready to be devoured.